Riley Mack and his band of "known troublemakers" return in this madcap comedy caper that blends Mission Impossible and Robin Hood! Wherever a wrong needs righting or an innocent kid needs protecting, Riley and his friends will be there, ready to use their troublemaking talents for the greater good. But this time, injustice strikes a little too close to home. One of the Troublemakers is in serious trouble, and all of Riley's efforts to help are only making things worse. With ten thousand dollars and the fate of his friends and family on the line, Riley will have to think fast if he hopes to pull of his most daring caper ever! "Grabenstein keeps the comedy flowing and the pages turning." 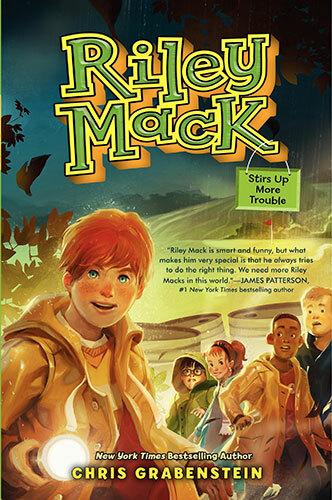 "Riley Mack is smart and funny, but what makes him very special is that he always tries to do the right thing. We need more Riley Macks in this world." "These clever, resourceful, detention worthy middle schoolers will have readers on the edge of their seats. Don't miss a grade A blast of the best kind of troublemaking."